The clue's in the title. 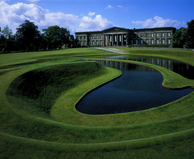 Contains a world-class permanent collection of modern and contemporary art both Scottish and international, as well as a regularly changing exhibiting programme. Go for a full spectrum of 20th and 21st Century art, from Picasso to Douglas Gordon.